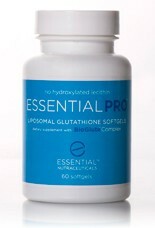 EssentialPRO™ is an advanced oral delivery system of reduced glutathione utilizing the power of the new BioGlute™ Complex. BioGlute Complex is a proprietary liposomal blend that combines reduced glutathione and specialized liposomes enriched with purified phosphatidylcholine. Phosphatidylcholine (PC), an essential phospholipid, is a major component of the body's cell membranes. This also includes the gastric mucosa, where oral supplementation with PC has been shown to provide gastrointestinal support to damaged cells. Phosphatidylcholine and lecithin are often used interchangeably to mean, "purified phosphatidylcholine." This can be a misleading as lecithin extract is actually a complex mixture of phospholipids, glycolipids, and triglycerides, containing less than 20% total phosphatidylcholine composition. The liposomes that make up BioGlute Complex contain more than four times the amount of phosphatidylcholine found in lecithin liposomes, increasing glutathione's absorption potential. That is the BioGlute advantage. licensed healthcare practitioner. Storage Requirements Store in a cool dry place away from direct light. For children under the age of 12 consult healthcare professional before use. If pregnant or lactating, consult your physician before taking this product.